Transporting Farm Equipment can be a daunting task for any individual, company, or government facility. Most farm equipment is oversized and overweight, which only adds to the difficulty. We at We Will Transport It, have the experience you need to get your farm equipment moved. Transporting Farm Equipment Service. This is just a small list of tractors and farm equipment we can transport. One of our logistics specialists can help you determine the method of transporting farm equipment that fits your needs. Best Transporting Farm Equipment Company in the US. The amount of farm equipment that needs to be shipped. The name, make, and model for each vehicle. Dimensions: height, width, length, and weight. Preferred dates and times of pickup and delivery. Once the method of Transporting Farm Equipment is determined, we can figure out the best route of travel and acquire all needed state and federal permits for shipment. Some states also require extra insurance when shipping equipment across state lines. After we receive all the paperwork needed for the trip, we can tell you the total cost of shipment. Shipment price includes all taxes, tolls, insurance needs and permits required. We can also tell you the estimated pick up and drop off times. These may vary due to traffic and/or weather. In addition to our expert drivers, we come with a portfolio of farm equipment transportation companies. We at We Will Transport It will be able to ship your equipment or find someone else that can do it better and at a reasonable price. When we offer our shipping quote, we will also provide quotes from the many different farm equipment transportation companies we are in contact with. If another transportation company is a better fit for your needs, we will facilitate communication between you and your company of choice. You can rest assured that We Will Transport It or any other shipping company we suggest will deliver your farm equipment safely and in a timely manner. Transporting farm equipment and hauling tractors can be a difficult process. Let us help you make the process simpler. DO YOU NEED HELP TRANSPORTING FARM EQUIPMENT? We Will Transport It is the most widely recognized and financially savvy approach to Transporting your Farm Equipment. Call and get a quote! 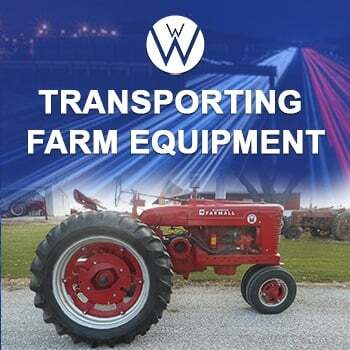 We Will Transport It is the Best Transporting Farm Equipment Company in the U.S. This is just a small list of tractors and farm equipment we can transport. One of our logistics specialists can help you determine the method of transporting farm equipment that fits your needs. Once the method of transportation is determined, we can figure out the best route of travel and acquire all needed state and federal permits for shipment. Some states also require extra insurance when shipping equipment across state lines. After we receive all the paperwork needed for the trip, we can tell you the total cost of shipment. Shipment price includes all taxes, tolls, insurance needs and permits required. We can also tell you the estimated pick up and drop off times. These may vary due to traffic and/or weather.